There's a lot of experimentation among the collection of items this month. 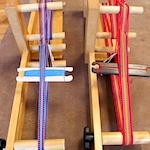 Two spinners have made swatches from different types of handspun yarn and compared them. Another inspects socks after a couple of years of wear to see how the opposing-ply yarn is holding up. 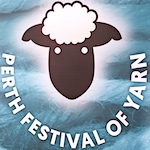 There seems to be more woolly festivals than ever. 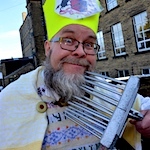 Bradford have recently revived an ancient gathering which is in tribute to a bishop who was martyred using wool combs. 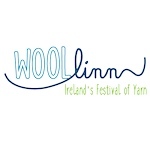 Our listing of woolly events is more comprehensive than ever. 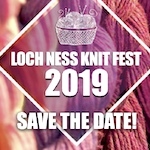 Read on for all of this and the rest of this month's cunning curated collection of inspirational information and entertainment for spinners, knitters, crocheters, dyers and weavers. This is the free issue for February 2019. 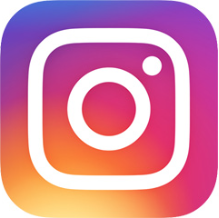 Find out how to receive a longer, ad-free version of HSN earlier in the month. This chap is depicting St Blaise, patron saint of wool combers and divine intervener in cases of objects stuck in the throat. 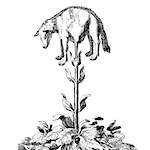 The saint's grizzly end involved wool combs, which were apparently used in medieval torture. His feast day is 3 February. 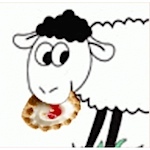 This year Bradford held a St Blaise Wool Festival, the first since 1825. 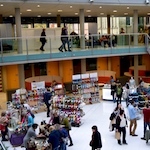 This picture is one of five which show revelers enjoying apacas, spinning demonstrations, activities and stalls. 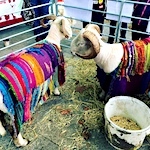 These colourfully-attired shorn sheep were seen in Norwich at the Norfolk Makers Festival. The centrepiece of this year's show is a knitted diorama of Great Yarmouth's Golden Mile set in the '70s. ITV News has some pictures and fabulous video which is well worth a watch. This is a very sad tale, and without wanting to give too much away, the thumbnail here shows the happy ending. 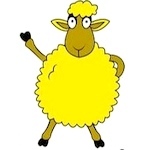 Because we use real wool and other feltable fibres in spun projects, and because accidents happen, Alice's story is well worth reading and remembering. Rachel says that she loves fibre clubs because they push you outside of your spinning comfort zone. 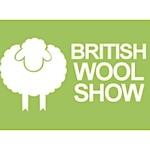 She received this batt which is Herdwick, sari silk and wool nepps. 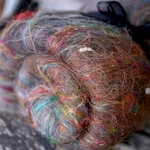 Click through to read a little about Herdwick fleece and to see the yarn that Rachel spun from the challenging batt. 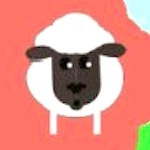 If someone told you that wool could grow on plants, and you know that wool grows on sheep, it's natural to assume that the plant produced a lamb, right? The spread of information in the middle ages was often by word of mouth, leading to some odd ideas. The sketch is from an 1887 history of the cotton trade which is available today in fascimile form. Devin Helmen likes to use a tightly-plied 2-ply yarn for socks, with plenty of twist in the singles. 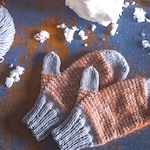 The sock pattern in this article was adapted from one that his great aunt used. It appeared in a recent Spin-Off magazine. 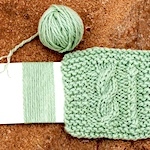 There are more spinning tips and details about the pattern in this article on the Interweave spinning blog. If you're stuck for inkle inspiration, try Rebecca Green's Procedurally Generated Inkle Patterns. 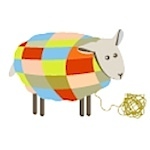 Every time you visit or refresh the page, you see a different pattern with a list of the colours and warping pattern. Spinner/weaver Annie MacHale grabbed a couple of patterns and made them. 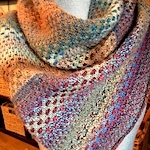 A hap is a garment to wrap yourself warmly. It may be triangular, square, rectangluar. 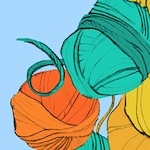 You may knit one for a newborn. 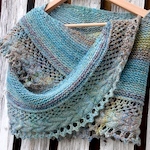 This piece by Anne Merrow contains comments from Kate Davies, Kate Larson and three tips for choosing the right yarn for your handspun hap. 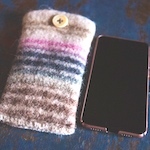 This tweedy yarn is Down breed wool with a little yak and silk. 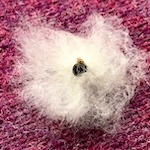 Joanne decided to try carding the wool but combed it first to remove vegetable matter. 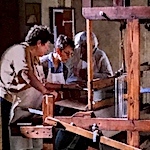 She also dyed the wool before carding and spinning. This post contains lots of pictures of the process with her notes. This post is originally written in German but it's such a very good post, I'm delighted that it is fairly comprehensible after being churned through Google Translate. Chantimanou has taken the same braid of fiber and made five very different yarns from it, made swatches and discusses the differences in some depth. 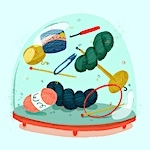 Sensitive readers may want to skip over this story but if you can cope with talk about hair and body lice, here are some interesting textile facts. The oldest known items of clothing are around 36,000 years old but this doesn't give us a clue about how long we've been wearing clothes because textiles don't generally survive such a length of time. 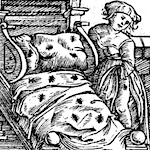 Our close companion, the body louse, indicates that we have probably been making and wearing clothes for several times longer than that. The details are in Christina Garton's article. April takes a look at how these socks are holding up after two and a half years. She made an 'opposing ply' yarn which is supposed to add strength because the one ply gains more twist as it's plied. 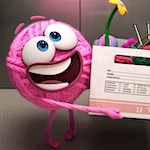 Purl is a new Pixar hero. Pixar SparkShorts is an experimental initiative that gives Pixar employees a chance to tell their own stories. 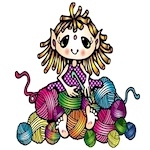 Purl's story is one of changing to fit in vs being true to yourself. 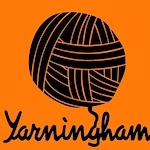 What is the best yarn for knitting cables? 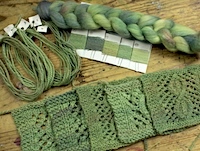 Melanie Smith spun and knitted samples to show which yarn, singles, 2-ply, or 3-ply, works best for knitting cables. 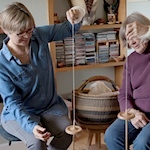 It's easy to be drawn into buying a small and delicate spindle and oh-so-soft fibre when you're learning. Some choices can make your journey more difficult. Ann Merrow lists five things that you might want to avoid. She's not being the 'spinning police' though. 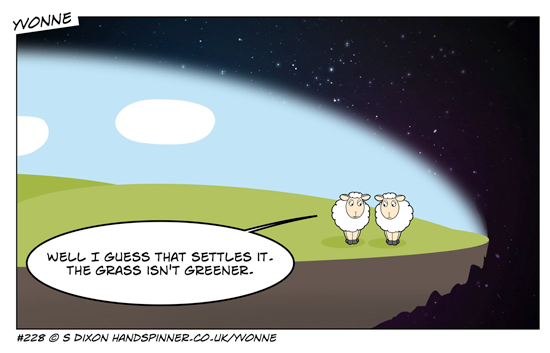 her final advice is to "just get spinning". 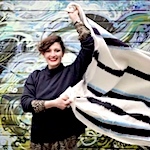 Amy king has begun making a series of five-minute 'back to basics' videos. They'll be very informative if you're just starting out. 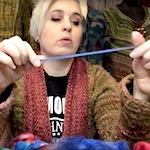 On this page are two such videos, one talking about the differences between roving and combed top, the other talking about staple length. But you'll never know unless you look. Thank you very much if you've had a go at any of these on your computer or tablet, particularly to the one or two people who've written to tell me that they've enjoyed them. 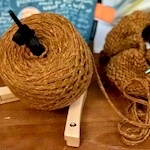 The yarn ball holder that Jillian reviews here and on Knitty is by Akerworks. They do appear to ship internationally. There are a few reasons to use one, which Jillian lists. She says that initially she wasn't convinced by the hype but after using it for a couple of months she doesn't want to knit without one. Judith MacKenzie's book The Intentional Spinner is well-established now. Kate Larson explains that opening it up can open "Intentional Spinner rabbit holes for you to explore!" 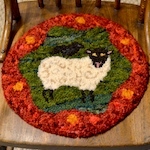 This is a beautiful finished project made from raw fleece. If you're interested in the details, Josefin's post is full of numbers, which I found strangely compelling. 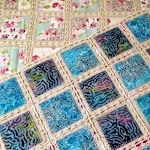 This stunning quilt is made using quilting as well as crochet techniques. 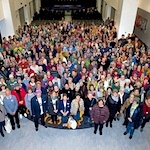 Goldilox's post has lots of details and is worth a read, and her photographs are well worth seeing full-size. 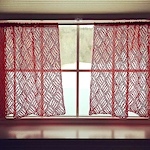 vermontgirlamy made these curtains from a commercial linen yarn in sport weight. The pattern is available for free. This pretty handspun art yarn spun by heritagehandspun is called Dusting of Snow. "Finally! 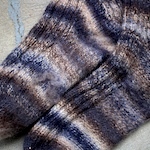 First handspun socks", says swatchophile. 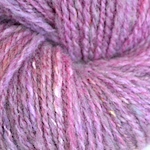 She spun the BFL/silk as a fine, overtwisted single, 2-plied and then knit with that held double. 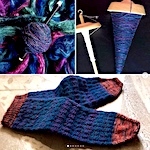 I like all the detail that swatchophile has written with her seven pictures of these magnificent socks. 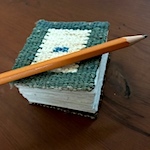 Sarah C Swett has been making tiny books with woven covers, sometimes using handspun yarn, sometimes that yarn is made from paper or other unusual materials. 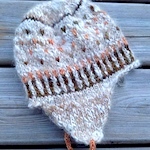 Dogfibres has made this hat from dog fibres as a charitable donation. 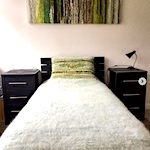 She says that "it is soft and will get softer as it is worn"
Also using dog fibres, this blanket and pillow set by milancorinne contains samoyed and alpaca. 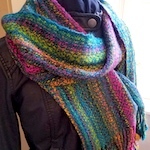 In this scarf, the handspun yarn is used for the warp. Thread Head Joanne used a punch needle and her handspun to make this chair pad. In this post she describes how she finished it. Alice has given this pattern for free, but it is one-size (8-year-old boy or very slender adult). 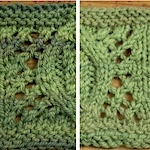 Darn Good Twist Lace Weight Silk Yarn is handspun yarn, and here DGY suggest three easy patterns for their yarn. 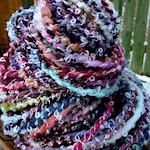 The patterns will of course also work with small amounts of your own handspun. 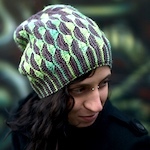 These five Woolly Wormhead patterns are available separately or as a collection. They're knit sideways and are reversible. 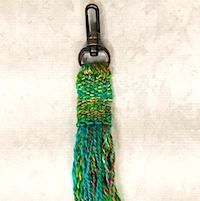 This is the second month in a row that I've bookmarked a finished handspun project using this pattern, so it seems appropriate to recommend the pattern here. The one pictured here is annettewv's. She is unsure about all of the yarn used, but it does include a skein of her handspun. 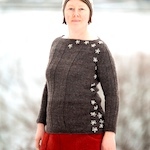 The pattern is The Shift by Andrea Mowry, the main link goes to the pattern page on Ravelry, where it has a low difficulty rating and a high star rating. 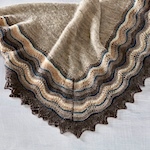 It looks like a triangular shawl but is actually a cowl that you throw on in a moment. 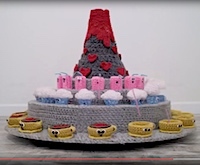 This is a zoetrope made from yarn made by filmmaker Sam Tilson and yarn artist London Kaye. It features a volcano dripping hearts down to milk cartons, which squirt from their straws into the cups below. A zoetrope traditionally had a rotating drum containing frames of an animation. There is a link below the video to a collection of 'behind the scenes' photos, which are well worth a look. It involves lots of 3d-printed parts, which are covered with crocheted fabric. With thanks to GW of Geekologie for sharing. 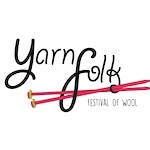 In its 11th year, the event will host a marketplace of over 70 quality exhibitors selling yarn & fibre accessories and feature a programme of bookable workshops, talks & demonstrations led by UK & International experts. 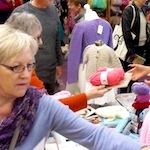 The popular fibre and textile show is returning to Heartlands on 17th March. 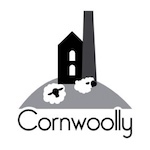 With over 40 exhibitors, Cornwoolly brings together suppliers of virtually everything you need for your project, including a vast array of wool in all its states, and showcasing some of the best textile artists working in the South West today. 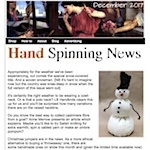 I'm Shiela Dixon, I've beeing doing this for around ten years, in order to promote and encourage the craft of spinning. 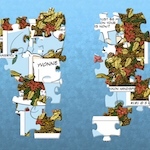 You can help to support this work with a regular contribution (pay what you like, no matter how small) and in return receive HSN earlier and receive a longer ad-free* version (approx half the number of stories again).